Byway Basics The Buffalo Bill Cody Scenic Byway, U.S. 14/16/20, follows the North Fork of the Shoshone River through scenic Wapiti Valley to the East Entrance of Yellowstone National Park. The 27 miles of paved Scenic Byway start about 25 miles west of Cody at the Shoshone National Forest border. Normal driving time from the forest boundary to the Park is approximately 45 minutes. The byway is open to traffic year round, but the East Entrance into Yellowstone closes the first Monday of November. Along the Way A gateway community to Yellowstone National Park, Buffalo Bill�s namesake town of Cody Wyoming has plenty to offer in its own right. Visit the Cody Nite Rodeo and see why they call this town the �Rodeo Capital of the World.� Or if you prefer your beef on a plate rather than in a stadium, eat out at the Historic Irma Hotel. Have a drink at their famous cherrywood bar�a gift from Queen Victoria to Irma owner Buffalo Bill�or watch the Cody Gunfighters perform live outside. Stop over at Old Trail Town for some life-sized history. The site is home to authentic western objects and architecture, including a Hole in The Wall Gang cabin, countless pioneer and Indian artifacts, and final resting place to the real life Jeremiah Johnson. The Buffalo Bill Historical Center is a must-see. With five world-class museums under one roof, it�s no wonder they call it the �Smithsonian of the West.� Once you�re back on the road and heading west from Cody, don�t� miss a stop at Buffalo Bill Dam. Prototype for world-famous Hoover Dam, this massive concrete wall boasts a structural height of 350 ft, its own visitor center, and a breathtaking walk along the top. From there it�s a gorgeous drive through Buffalo Bill State Park into the Wapiti Valley and the byway proper, a geologist�s dream and the country that Teddy Roosevelt once called �the most scenic 50 miles in the world.� The byway ends in spectacular fashion at Sylvan Pass (el. 8530 ft./2600 m.) with a sweeping mountain view and the East Entrance to the world�s first national park, Yellowstone. Byway Basics The Chief Joseph Scenic Byway, Wyoming 296, links the town of Cody with the Beartooth Highway and the Northeast Gate of Yellowstone National Park. The route crosses the Shoshone National Forest through the Absaroka Mountains to the Clarks Fork Valley. The 47 paved miles of the Scenic Byway run from the junction with U.S. 120, 17 miles north of Cody, northwest to their connection with U.S. 212, the Beartooth Highway. The Beartooth Mountains and the Clarks Fork of the Yellowstone River lie to the north of the road, and the Absaroka Mountains and North Absaroka Wilderness are to the south. The most predictable times to drive this highway are during the fall and summer. During the winter months snow plows keep the roadway open to just east of the entrance to Yellowstone National Park. Allow one hour minimum driving time over this stretch of Byway. Roadside History The Chief Joseph Scenic Byway is named after the Native American chief of the Nez Perce Tribe. Following the Battle of the Big Hole in Idaho in 1877, Chief Joseph fled east through Yellowstone. He and 1,000 members of his tribe ran from the US Cavalry, who were trying to force the tribe onto a reservation so that white ranchers could have their lands. While crossing Yellowstone, the Nez Perce briefly captured several tourists before going north up the Clarks Fork River. The Nez Perce were trying to flee to Canada (an 1,800 mile trek), but surrendered after the six-day Battle of the Bear Paw in northeastern Montana. The tribe was stopped only 30 miles from their destination, the Canadian border. In his speech of surrender, Chief Joseph expressed dignity and defeat with his famous words, `Hear me, my chiefs, I am tired; my heart is sick and sad. From where the sun now stands, I will fight no more forever.` The Nez Perce tribe was forced onto reservations in Oklahoma and Washington despite promises to allow them back on their lands. Yellowstone`s Nez Perce Creek is named for this valiant attempt at freedom. The road between Cody, Wyo. and Yellowstone National Park is often called �the most scenic 52 miles in America.� But for a spectacular drive that locals cherish and most visitors never discover, take a trip through the South Fork Valley. Wild horses still roam freely in the Pryor Mountains outside of Lovell, Wyoming. This herd of horses is very special because of its Colonial Spanish American heritage. This tough little horse, derived from the horses of Portugal and Spain, has been present in this rugged mountain area for nearly 200 years. If lost, the herd cannot be restored; and so its biological viability, together with its history, must be preserved. It is the purpose of the PRYOR MOUNTAIN WILD MUSTANG CENTER to do just that. 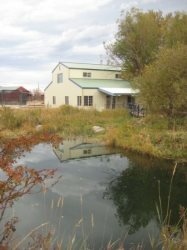 The Pryor Mountain Wild Mustang Center is a public, nonprofit 501(c)(3) educational institution, unique in purpose and location. The Center is working towards becoming the foremost wild horse educational institution in the world. This adventure is a true American wild mustang safari.Out here,we never know what�s gonna happen.Its wildlife at its finest,and we get the pleasure of sharing this adventure with our guests.Every tour,to the McCullough Peaks Wild Mustang Area,is unique.On this tour we could see the Mustangs: Playing,fighting,or relaxing.No matter what the Mustangs are doing,it�s always an adventure!! !